Something so many have been concerned about lately is the safety of non-stick pans. It's been so concerning that people have told me that they won't buy nor give them. Well thankfully my Mum found an alternative that I really wanted to share with you all here. The green M'stone non-stick pans and pots by Mauviel 1830. A French based maker of pots and pans coated with PFOA and PTFE free anthracite stone. Handmade in Normandy France grants them instant heirloom status. Borrowing to take them for a spin I wanted to share a simple pasta and clams in a sauce of white wine, clam broth, garlic, fresh tomatoes from the garden and Parmesan cheese. 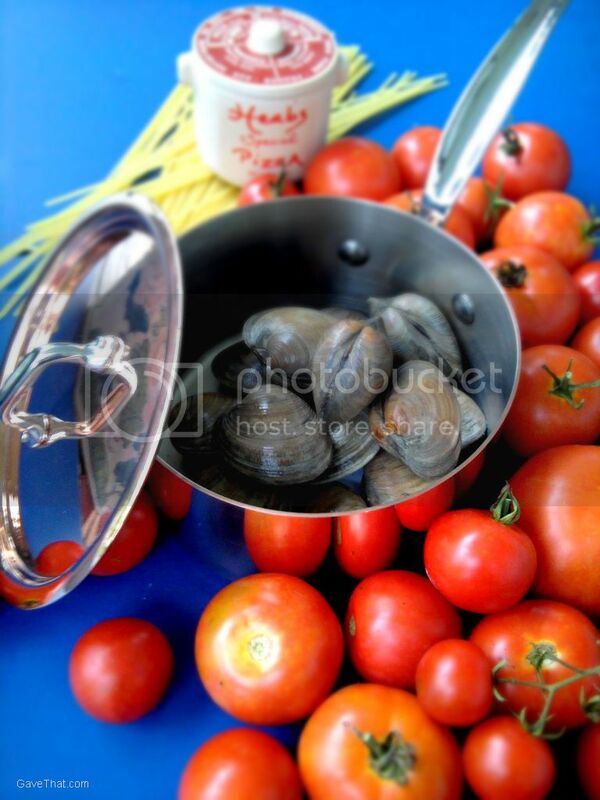 A simple pasta and clams dish in a sauce of white wine, clam broth, garlic, fresh tomatoes from the garden and Parmesan cheese. 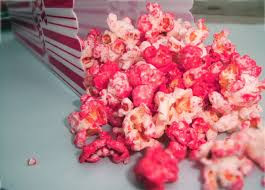 One of my favorite ways to use summer tomatoes from the garden. 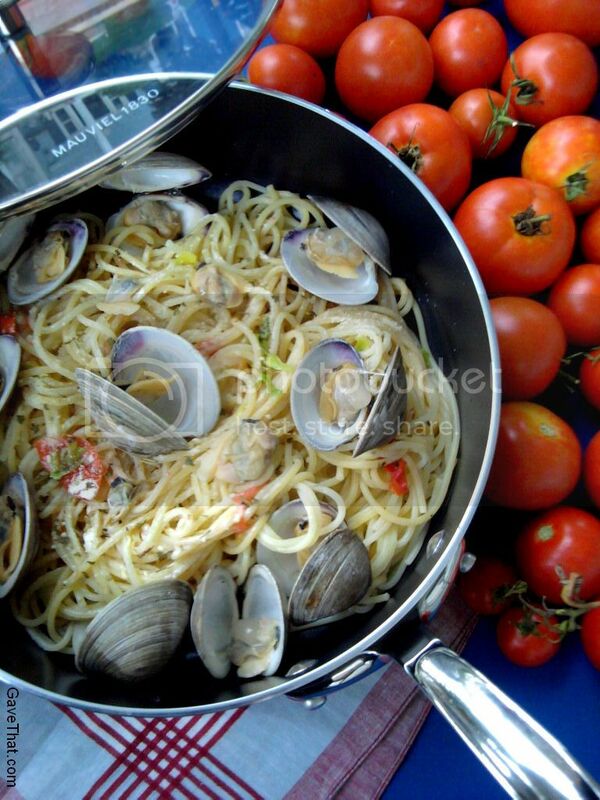 Steam clams in white wine and set aside reserving strained liquor.Boil spaghetti in salted water until tender. Drain and set aside.In a large sauce pan over medium heat add 1 Tablespoon olive oil and add garlic until slightly brown. Add tomatoes and seasonings. 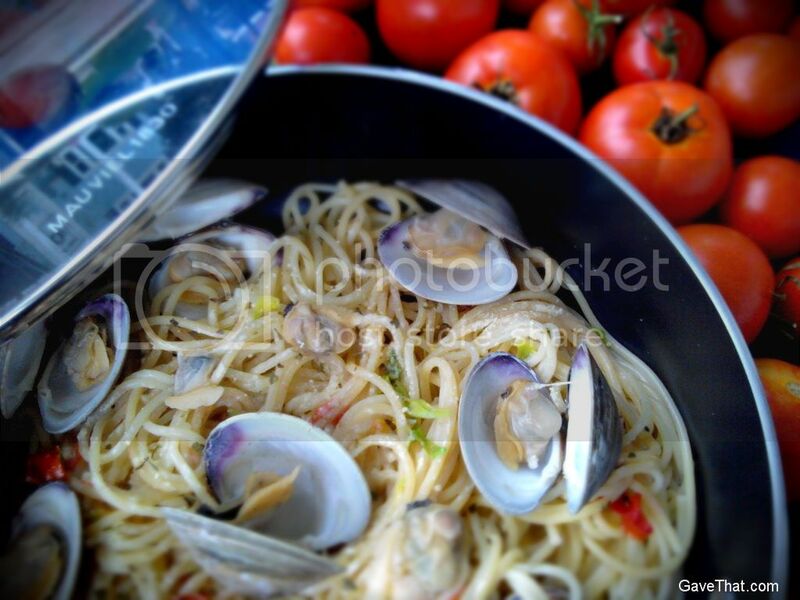 Cook for 5 to 7 minutes before adding reserved clam liquor and white wine. Allow to simmer for 10 to 15 minutes. Finish by adding Parmesan cheese.Add spaghetti to the sauce and stir to coat. Drizzle with remaining 4 Tablespoons of olive oil and sprinkle with parsley.Mound pasta onto platter and arrange clams on top.